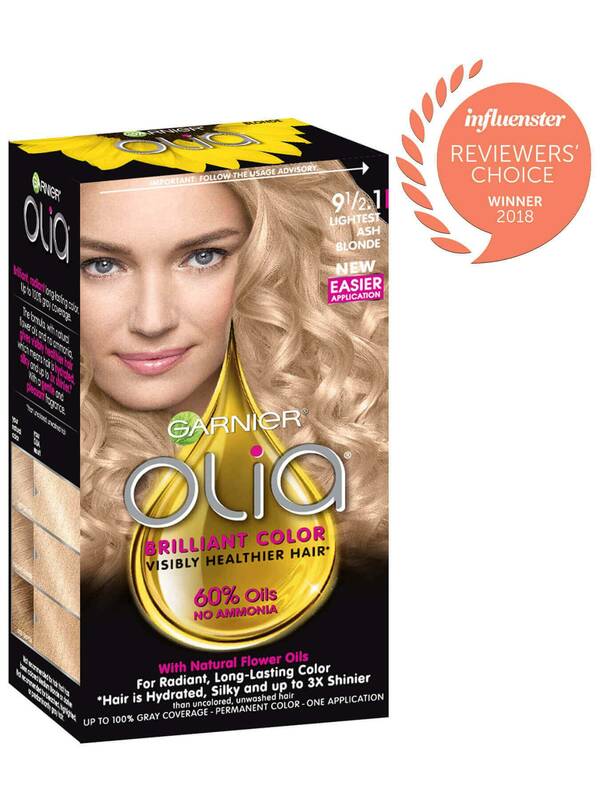 Garnier Olia shade 9 1/2.1, "Lightest Ash Blonde," is our lightest blonde shade and has cool reflects, designed to lighten and neutralize blonde hair. It is best for anyone with natural hair between light blonde and dark blonde. 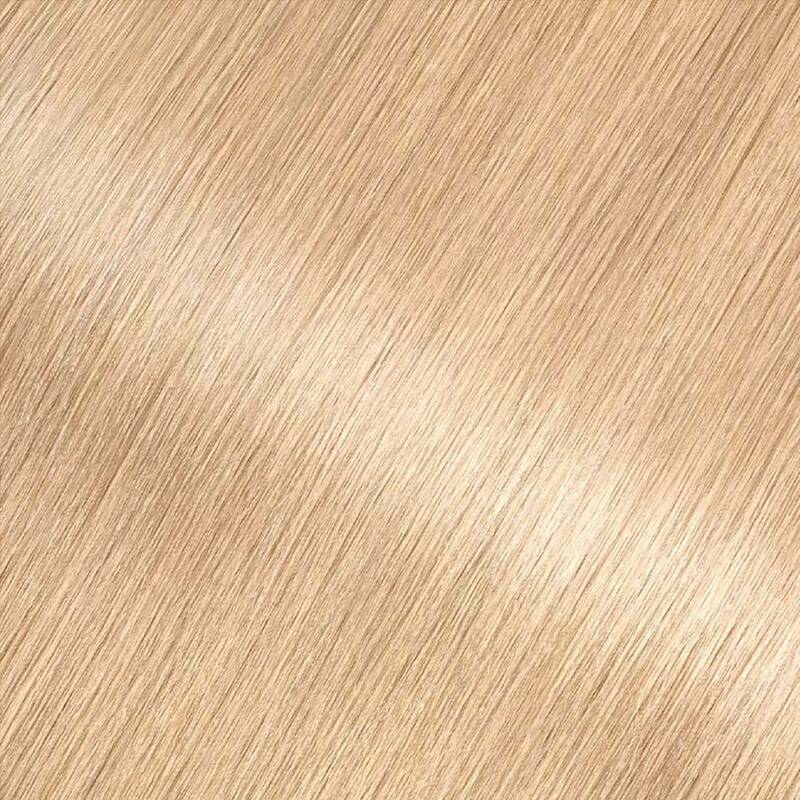 If this shade is too light for you, try one of our other blonde shades such as 9.0 or 8.0. *For women with currently color treated hair, there are special considerations for the color results you can achieve. 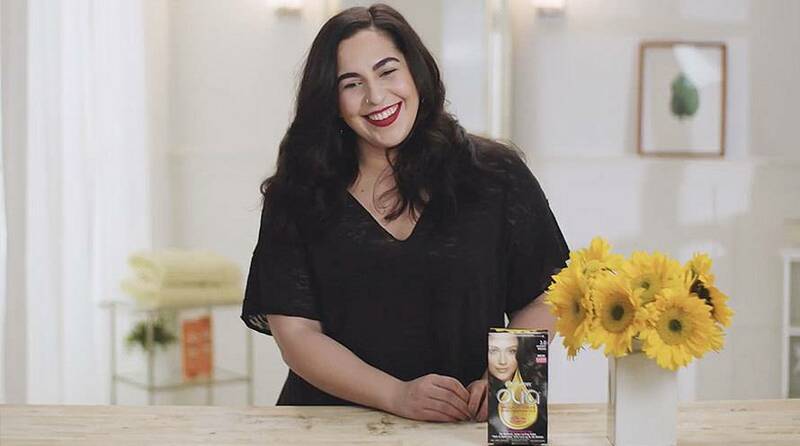 Because of this, we do not recommend shade 9 1/2.1 for hair that has been previously colored shade 7.0 "Dark Blonde," or darker, or for predominantly gray or previously bleached hair. For more help, use our Shade Selector Tool to find the perfect shade for you! Rated 5 out of 5 by KLSUGAR from Beautiful Ash Blonde! I love this color! I have naturally dark blonde hair with a few grays now and I color my roots every 3 to 4 weeks. This color comes out a beautiful light ash blonde. I have gotten so many compliments on it! Please don’t discontinue this shade, it’s perfect!!!! Rated 5 out of 5 by katie0603 from Lightest ash blonde comes out amazing! Lightest ash blonde came out great! Colored my natural light brown roots and evened out my blonde tone! Please don’t discontinue this color/shade! Rated 1 out of 5 by Amylynne from DO NOT WASTE YOUR MONEY I was looking to brighten my light gold hair... I ended up brunette. So if you’re looking for brown hair use this, however if you want the color the picture on the box has/and actually want to lighten your dirty blonde hair up, do NOT use this. Rated 5 out of 5 by em77 from 9.1/2.1 - My favorite hair color! I buy this regularly and love it. Sadly my local stores don’t seem to sell it so I generally buy from Amazon. I hope that this shade is not discontinued. When I color, I let it process longer (about an hour) bc my roots tend to pull orange (My natural color is dark blonde, with a few grays now.) I followed advice from an Amazon review to use a light blonde (9.0) with this as well to give dimension. I just alternate each color every inch or so, focusing on my roots. Then I wash with a purple shampoo and it comes out great every time and my hair feels soft and smooth. Love this color! Rated 1 out of 5 by Cindy Judge from Olia 9 1/2 Lightest Ash Blonde I bought this product for the first time, was very disappointed. Did not cover my grey at all. I have a streak one one side and a bit of grey by my temples. Followed directions to a T.
Rated 5 out of 5 by jdan9899 from Beautiful Color! I've been dying my hair for around 8 years. I've done at home and salon. This color is absolutely amazing! And gave me similar results as what I've had at a professional salon. I love it, and my hair feels nice and healthy! Will buy again. Rated 5 out of 5 by be peace from the best I've used this color for a few years and local stores are no longer carrying it. It is far superior to everyother brand I have tried and leaves my hair in better condition than before I retouch. Ive stayed to other brands here and there and am always mad at myself after. I always get compliments on the natural looking ash color when I use this product. Im 50 now, and still able to maintain unbroken long hair even though my hair is naturally wavy thin and fragile. It improves the brittleness that other colants cause. LOVE IT! thanks for carrying online!!! Rated 5 out of 5 by Ivory from Only ash blonde dye that ever worked for me I've used probably every ash blonde dye on my unnatural yellow blonde hair through the years and they never did much to fight the brass. Then came this due and OMG! Forget wella toner, forget it all! My hair is a light white blonde shade that I've never been able to achieve. I would say you should only use this if you are strictly a warm shade of blonde or else you might end up gray, because this stuff is powerful. Upon first applying it, I saw it working right away. I'll totally be using this for touch ups from now on. Amazing.